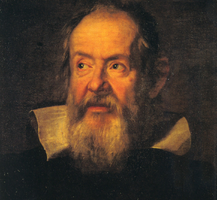 Galileo attended Pisa University from the age of 17. He started studying medicine, but switched to mathematics. He was appointed to the Chair of Mathematics in Pisa at the age of 25. The prevailing views on the motion of the planets and bodies at the earth's surface dated from Aristotle. Aristotelian thinkers believed, for instance, that heavier bodies fell faster than slower ones, and that without a resisting medium like water or air, a body would fall infinitely rapidly. This assertion led them to believe that a vacuum could not therefore exist. The quizzical views passed down from his father served Galileo well. He began to develop a way of thinking about the world that involved measurement, hypothesis, mathematics, and reproducibility. He described experiments, such as dropping two different sized stones from the top of the Leaning Tower of Pisa and noting that they hit the ground at the same time; and showing that a feather and a pebble fell at the same rate in an evacuated tube. 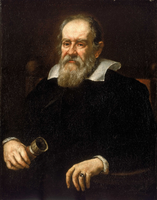 Many people believe that Galileo's experimental, rather than introspective, approach represents the beginnings of the scientific method; Stephen Hawking wrote 'Galileo, perhaps more than any other single person, was responsible for the birth of modern science.' Nevertheless, it seems likely that the Leaning Tower experiment never actually happened in that form: Galileo's own description is a thought experiment and does not include details of the method in the way that would be crucial to modern ideas of reproducibility. In early 1609 Galileo heard of the invention in the Netherlands of an instrument for magnifying the image of distant objects. He began work on developing telescopes and discovered that our moon is cratered, not smooth. He also discovered that Jupiter has moons, and that there are many more stars than can be seen with the naked eye. He was one of several people who independently discovered sun spots. Galileo supported a heliocentric (sun-centred) view of the solar system, and this brought him into conflict with the Catholic Church. In 1633 he was brought before the Inquisition and pronounced 'vehemently suspect of heresy'. He was made to renounce his views, and was sentenced to lifetime house arrest — effectively life imprisonment. He returned to his work on the motion of bodies, and wrote a book on the laws of motion and the strength of materials that was smuggled out and published in the Netherlands in 1638. Galileo died in 1642, blind, but still working. Mechanical clocks were well known in Galileo's day — the oldest surviving clock in Europe dates from around 1386, almost two hundred years before Galileo's birth, and there is good evidence that such clocks were known one hundred years before that. 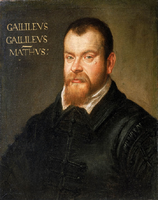 Galileo's contribution was essentially theoretical: as a young man he noticed that a pendulum swings at a constant rate (at least, almost constant for small angles). At the end of his life he devised a scheme for using a pendulum to regulate a mechanical clock. 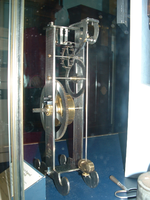 However, the first reliable pendulum clock was only demonstrated by Huygens 15 years after Galileo's death. One day in 1641, while I was living with him at his villa in Arcetri, I remember that the idea occurred to him that the pendulum could be adapted to clocks with weights or springs, serving in place of the usual tempo, he hoping that the very even and natural motions of the pendulum would correct all the defects in the art of clocks. But because his being deprived of sight prevented his making drawings and models to the desired effect, and his son Vincenzio coming one day from Florence to Arcetri, Galileo told him his idea and several discussions followed. Finally they decided on the scheme shown in the accompanying drawing, to be put in practice to learn the fact of those difficulties in machines which are usually not foreseen in simple theorizing. The basic principle of the Galileo clock (and indeed all mechanical clocks) is that the energy in a coiled spring or the potential energy of a descending weight is dissipated in regular pulses. The mechanism to do this is called an escapement because it allows the energy to 'escape' from the system. Galileo used a pinwheel and a pair of curved pawls connected to a pendulum. As the pendulum swings, one pawl lifts clear of the pins allowing the wheel to rotate until 'caught' by the other pawl. As the pawl is caught, it imparts a small impulse to the pendulum which keeps it going. Without this crucial feature, the pendulum would simply run down. In this way, though, the pendulum regulates the release of energy, but is itself 'recharged' on each swing. It is important that the pulse is given at just the right part of the pendulum's swing. A child on a swing is, in effect, a pendulum. When you push somebody on a swing, you wait until they are just at the top of the arc, and then give them a little helping push as they begin to descend. If you push them as they come up to you, the smooth rhythm is lost. It turns out that the main arts of clock design are to (a) reduce the inertia of, and friction between, the moving parts in the clock so that only tiny pulses of energy are needed to keep everything going, and (b) to perturb the motion of the pendulum as little as possible so that its movement approximates that of a free pendulum. 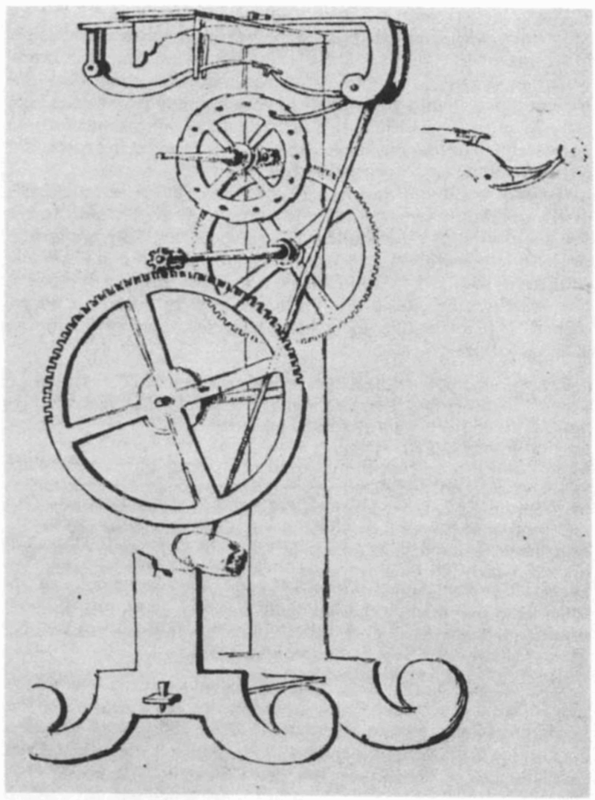 The Galileo escapement is not very good in either respect, but then neither was the verge escapement used on contemporary clocks. There is some evidence that Galileo's son Vincenzio constructed a clock according to this scheme but did not manage to make it work reliably. 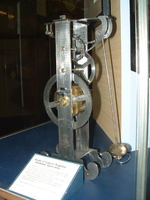 Sometime in the nineteenth century, a model was made which was given to the London Science Museum in 1883 and is now on display in their Time Measurement gallery. The model is often running: here are some pictures, including three links to the official Science Museum site. 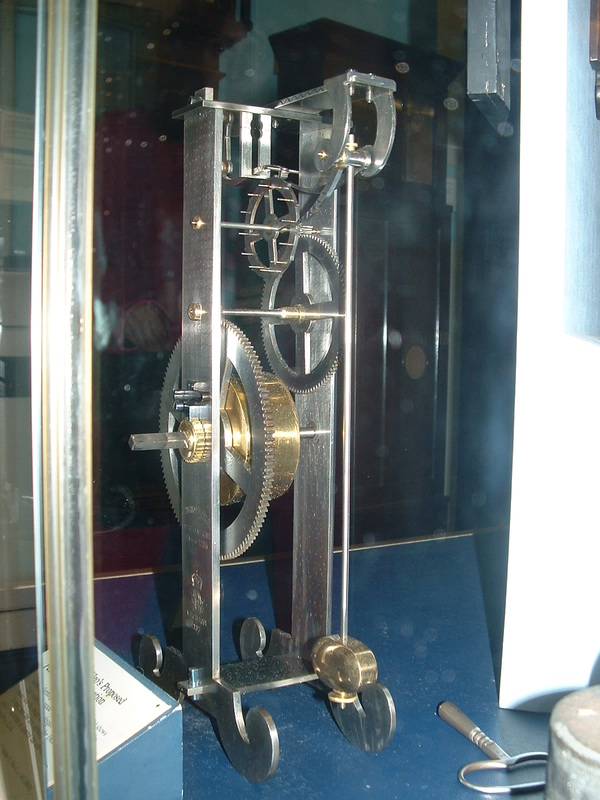 Some books on clock making include practical details of the Galileo scheme, and Lindsay Carroll has described a Meccano version which you can read about here. I've designed a pinwheel escapement inspired by Galileo's scheme which you can build from standard parts and experiment with which you can read about here. The Lego version is easy to experiment with, but not very accurate as the pendulum's motion is significantly disrupted by the escapement. Pages written by Adrian Johnstone, last updated 8 July 2009.